KALISPELL - The once-brilliant oil painting arrived looking as if it had been rolled up and forgotten for years in some grimy garage - which, in fact, it had. Filth was ground deep into wrinkled canvas, the whole covered in creases and cracks, worn, torn, missing paint in not a few places. The entire bottom right corner was long since gone, a ragged canvas edge slowly unraveling, time inexorably uncreating a masterful landscape. "To unroll it and look at it," said Joe Abbrescia Jr., "a lot of people would say 'just throw it out, there's nothing you can do.' But it's amazing what's possible." What proved possible, as he promised, was amazing. He affixed new canvas behind the old, sealed tight with lining wax, then knit seamless patches into the work. He flattened the painting, stretched it, cleaned it, carefully, one square inch at a time, Q-tip rubbing, rubbing, gently, hour after hour, lifting grime and soot and finally old yellow varnish. Then he mixed oils of his own, more hours blending, experimenting, crafting a color not seen since the original artist worked his palette. Abbrescia wore a magnifying visor, face pressed close, studying the brush strokes, the texture and techniques he would need to fill in the gaps. "You have to interpret each painting individually," he said, "to see how that artist did what he did." To see how Abbrescia did what he did, you would have had to crouch over his hunched shoulders for months on end, for hundreds of hours or more, watching as he scraped away the decades, exposing a world not seen since artist John Fery put brush to board some 80 years ago. "Who knows when the last time was when that painting was viewed the way it was supposed to be, with the original colors the artist chose. It's really exciting to see a painting come back to life." Using his own oils to fill in where the original paint has been chipped away or otherwise lost, Abbrescia works tediously to mix the right colors. Abbrescia's life is about bringing paintings back to life, the life of fine-art restoration. His Flathead Valley studio is among the best in the business - you'd have to travel all the way to Denver to find anything like it. That it thrives in the tiny town of Kalispell is testament to changing times here, to a new economic era in which there are enough oil paintings - indeed, enough torn and dirty oil paintings - to keep an art restoration outfit busier than Abbrescia, for one, would like to be. "I don't advertise," he said. "There's more than enough work here." That surely wasn't always the case. In the mid-1970s, when Abbrescia's artist-father, Joe Sr., arrived to paint his sweeping oils, there were only a smattering of art dealers in the entire region. Today, the local phone book lists a full 60 galleries and dealers, all selling pieces that might, in due time, make their way to Joe Jr. The indignities are many. These works might be rolled up and forgotten like that batered piece by Fery, or they might have a sticky soda pop explode on them, or they might be hung over fireplaces where smoke and soot rise to slowly obscure the colors. They might have been through a flood or a fire, or a tiny tot might throw a football straight through the canvas. "I've seen it all," Abbrescia said. He saw it first as apprentice in his uncle's Chicago art restoration studio. For five long years, Uncle Dominick brought Abbrescia the tattered and torn, painstaking work, exacting, precise, work that after a couple of hours leaves you "bug-eyed." And then, about six years ago, Abbrescia's father - by now a renowned Montana painter - bought a big old stack of Fery originals. Hired by the railroad to paint portraiture of Glacier National Park, Fery was most prolific during the 1920s and 1930s. "They were in pretty rough shape," Abbrescia said of his father's purchase. And so Joe Jr. came for a month, setting up shop to clean and restore Fery's remarkable luster. Then he came for another, and another, six months in all. "I was able to see that we could pick up more work," Joe Jr. said, "and maybe even make a living here." With that, he quit the Chicago art scene and came home to Montana. "Being around art all my life, it was really interesting to spend my days with all these important pieces, right here in the Flathead," he said. He's worked on big pieces, murals even, as well as small works, new works, old works. Some have value only because they were painted by old auntie Ada. Others would bring an easy million at auction. The "middle-of-the-road" piece he sees might sell for $400,000. And that makes Abbrescia as careful with his words as he is with his work. He doesn't like to talk about which famous paintings are hanging around the Flathead, doesn't like to talk about who owns what, about which wealthy newcomer is his latest client. He shies from the question, allowing only that, "Yeah, I know who's in a couple of those helicopters flying over the valley." If his clients are something of a trade secret, then so are his techniques. People are always calling, he said, wanting to know how to clean their art. But he can't tell them. "Every painting is different." Abbrescia has chemicals that remove dirt, chemicals that remove grime, that remove smoke, that remove aged varnish. His is something of a black art, akin to alchemy, and it can be dangerous. "You can ruin a painting just as fast as you can clean it, with some of these chemicals," he said. But if you're careful, if you've mixed the proper brew, then dusty yellow peels away to reveal bright white, and gray gives way to bright blues and royal purples and deep green colors not even yet named. Abbrescia carefully fills in a small area on a painting made by popular western artist Ace Powell. Light blues and whites are pretty hard, and don't peel away so easily. Dark colors, though, don't set up as well, and "can be quite touchy." As he talks, Abbrescia works his cotton across a tiny face painted back in 1856, swirling his chemical elixir through years of dirt. As if by magic, the intricacies emerge, the detail and the depth, the richness that made the masterpiece masterful in its day. "There," he says finally, "now you can see the face." He's scraped time from Russell and Cause and Payne, as well as from the European masters, always starting small, always moving slow. "It can be scary," he said. "You don't want to remove paint, that's the big rule." The other rule is never do anything you can't undo later. 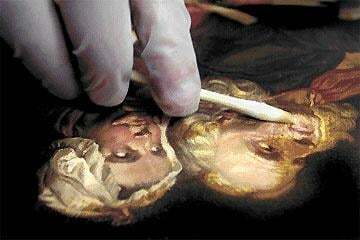 Many believe restoration destroys the historic value of a painting, and all agree less is more. But with his light touch, Abbrescia remains convinced he's restoring history, not destroying it, letting the original light shine through, the light intended. The work can become "tedious," he admits, "and the hardest part is you want to go faster. But you can't. It's a little nerve-wracking, especially on the more expensive pieces." Some of those pieces come from Chicago or Arizona or Seattle, he said, from private collectors and from dealers, but most, surprisingly, come from his Flathead Valley backyard. "There's some fantastic art here now," Abbrescia said. "You'd be amazed what people around here own." And you'd be amazed what he can do with what they own. He can tell an early Fery from a later Fery by the brush strokes, can tell a nice Powell from a nice Powell by the style, can follow line and form and color and technique from the big picture down to the square inch. "I know what I like," he says of his personal art criticism. And he knows what to do with it once it's been reclaimed from that dirty garage. That Fery, the one that came in ready to decorate the local dump, went out a $20,000 success story. But that's not why he restored it. "They're just beautiful," Abbrescia said. "It's incredible to be able to bring a painting back, to preserve that work the artist did. I'd like to talk to some of these deceased artists - hopefully, they're smiling at me, about what I've been able to do for their art, to bring it back to show people the world the way they saw it." Reach reporter Michael Jamison at 1-800-366-7186 or at mjamison@missoulian.com. Reach photographer Kurt Wilson at (406) 523-5244 or at kwilson@missoulian.com.